309, Ribes aureum (Missouri Currant); stamens and petals perig. ; ovary inferior. 810, Saxi-fraga Virginiensis; half superior. 311, Fuchsia gracilis (Ear-drop); inferior; stamens epipe-talous. 467. In the cases above cited, it is commonly taught that the receptacle is located at the base of the ovary, and that all the organs thence arising are adherent to its sides. Another doctrine is also taught, viz., that the receptacle itself may be elevated and become perigynous or epigynous, or, in other words, the ovary may bo imbedded in the foot-stalk. That it is so in the rose (289) we can hardly doubt. The so-called calyx-tube of the cherry, peach, is certainly an analogous structure, more expanded, and so is the more contracted " calyx tube" of the apple, pomegranate. The analogy extends throughout the Roseworts, and perhaps still further. Polypetalods, regular - Cruciform, rosaceous, caryophyllaceous, liliaceous. Irregular - papilionaceous, orchidaceous. 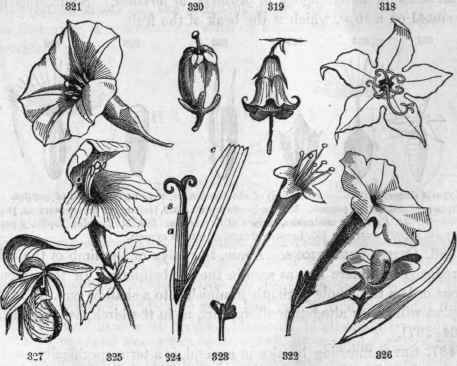 Monopetalous, regular mostly - rotate, cup-shaped, campanulate, urceolate, funnel-form, salver-form, tubular. Irregular - ligulate, labiate. 470. Cruciform (crux, a cross) or cross-shaped, implies that four long clawed, spreading petals stand at right angles to each other, as in the flowers of the mustard family (Cruciferae) in general. 471. Rosaceous, rose-like; a flower with five short-clawed, spreading petals. 472. Caryophyllaceous, pink-like; a five-petaled corolla, with long, erect claws and spreading laminae. 473. Liliaceous, like the lily; a flower with a six leaved perianth, each leaf gradually spreading so as to resemble, as a whole, the funnel-form. Forms of corollas. 312, Cheiranthus (stock). 313, Silene regia (scarlet catchfly). 314, Pyrus coronaria. 315, Amaryllis (Atamasco lily). 474. Papilionaceous, butterfly-shaped; a corolla consisting of five dissimilar petals, designated thus: the upper, largest, and exterior petal is the banner (vexillum); the two lateral, half-exterior, are the wings (aloe); the two lower, interior petals, often united at their lower margin, are the keel (carina). The flowers of the pea, locust, clover, and of the great family of the Leguminosae in general are examples. 316, Papilionaceous flower of the Pea. 317, Displayed; v, the vexillum; a, a, the alae; c, c, the carinae. 318, Section of flower of Dicentra Cucullaria. 475. Rotate, wheel-shaped or star-shaped, is a monpetalous form, with tube very short, if any, and a flat, spreading border, as the calyx of chickweed, corolla of Trientalis, elder. It is sometimes a little irregular, as in mullein. 476. Cup-shaped, with pieces cohering into a concave border, as in the calyx of mallows, corolla of Kalmia, etc. 477. Campanulate or bell-shaped; when the tube widens abruptly at base and gradually in the border, as in the harebell, Canterbury bell. 478. Urceolate, urn-shaped; an oblong or globular corolla with a narrow opening, as the whortleberry, heath. 479. Funnel-form (infundibuliform), narrow tubular below, gradually enlarging to the border, as morning-glory. 480. Salver-form (hypocrateriform), the tube ending abruptly in a horizontal border, as in Phlox, Petunia, both of which are slightly irregular. 482. Ligulate (ligula, a little tongue), apparently formed by the splitting of the tubular on one side. The notches at the end plainly indicate the number of united petals composing it, as also do the parallel, longitudinal seams. 483. Labiate, bilabiate, lip-shaped, resembling the mouth of an animal. This very common form results from the unequal union of the parts, accompanied with other irregularities. In the labiate corolla three petals unite more or less to form the lower lip, and two to form the upper. 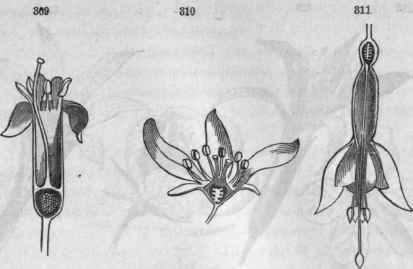 In the calyx, when bilabiate, this rule is reversed, according to the law of alternation of organs; two sepals arc united in the lower lip and three in the upper, as seen in the sage and the Labiate Order generally. Labiate flowers are said to be galeate or helmeted when the upper lip is concave, as in catmint; ringent or gaping when the throat or mouth is wide open; personate or masked when the throat is closed as with a palate, like the snapdragon. Forms of corollas. 818, Campanula Americana; rotate. 819, Campanula divaricata. 320 Andromeda, urceolate. 321. Convolvulus (morning-glory). 822. Petunia. 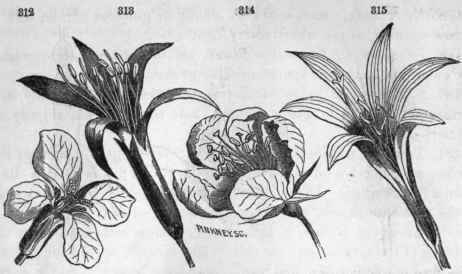 323, Lonicera sem-pervirens (honeysuckle). 324, Dandelion; ligulate corolla (c), 5-toothed; a, five anthers united into a tube around 8, the style. 325, Synandra grandiflora, ringent, upper lip 2-lobed, lower 8-lobed. 326, Linaria (yellow snapdragon), personate. 327, Cypripedium acaule, orchidaceous. 484. Orchidaceous, a form of the perianth peculiar to the Orchis with that large and singular tribe in general. It is a 6-parted double perianth, very irregular, characterized chiefly by its lip (labellum), which is the upper petal (lower by the twisting of the ovary) enlarged and variously deformed. 485. Pappus (πaππoς, grandfather, alluding to his gray hairs) is a term applied to the hair-like calyx of the florets of the Compositae and other kindred orders. The florets of this order arc collected into heads so compactly that the calyxes have not room for expansion in the ordinary way. The pappus is commonly persistent and often increases as the fruit matures, forming a feathery sail to waft away the seed through the air, as in the dandelion and thistle. It varies greatly in form and size, as seen in the cuts, sometimes consisting of scales, sometimes of hairs, again of feathers or bristles. Sometimes it is mounted on a stipe, which is the beak of the fruit. Cypsela (incorrectly called achenium) of the Composite, with various forms of pappus. 328, Eclipta procumbens, no pappus. 329, Ambrosia trifida. 330,IIelianthus grosse-serratus, pappus 2-awned. 881, Ageratum conizoides, pappus of five scales. 332, Mulgedium, capillary pappus - cypsela slightly rostrate. 333, Lactuca elongata, rostrate cypsela. 486. Other reductions. Again, the calyx or the limb of the calyx is reduced to a mere rim, as seen in the Umbelliferae. In the amentaceous orders the whole perianth diminishes to a shallow cup, as in the poplar, willow, or altogether disappears, as in the birch, ash, lizard-tail. (264-267). 487. 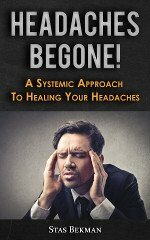 Setae, meaning bristles in general, is a term specifically used to denote the reduced perianth of the sedges. 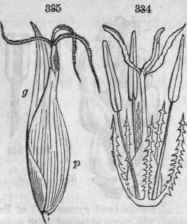 In the bog-rush (Scirpus) there is, outside the stamens, a circle of six seta?, which doubtless represent a 6-leaved perianth. In the cotton-grass (Eriphorum) the setae are multiplied and persistent on the fruit, becoming long and cotton-like. 488. Perigynium is the name given to the urceolate perianth of Carex, investing the ovary but allowing the style to issue at its summit. It is evidently composed of two united sepals. 490. The duration of the calyx and corolla varies widely, and is marked by certain general terms. It is caducous when it falls off immediately, as the calyx of poppy, corolla of grape; deciduous when it falls with the stamens, as in most plants; and persistent if it remain until the fruit ripens, as the calyx of apple. If it continue to grow after flowering, it is accrescent, and if it wither without falling off it is marescent. 334, Flower of Scirpus lacnstris, magnified; consisting of six setae, three stamens, three pistils united, except the stigmas. 335, Flower of Carex rivularis ♀, with g, its glume, p, its bottle-shaped perigynium, 2-toothed at top, enveloping the triple ovary; stigmas, three.